When Emerson first arrives at Camp Outlier, he doesn't want to be there. As a RISK kid, he's been treated as an outsider his whole life, and the steel boots and vest that he has to wear don't help things any. Then he discovers that being at a camp with other kids like him, who have uncontrollable superpowers, isn't so bad, and he fits in better than he could ever have imagined. For the first time in his life, Emerson isn't spending all his time playing video games, and he has friends. 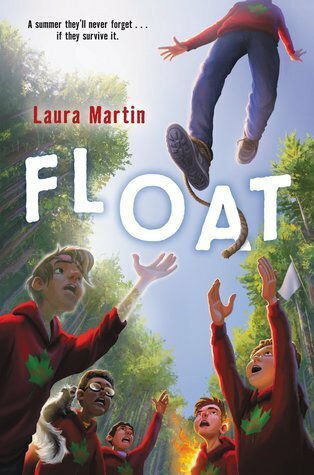 But things take a dangerous turn when Emerson discovers that one of his camp mates has a dangerous secret that will change everything. And since the adults can't or won't do anything, it's up to Emerson and his new found friends to save the day. Martin has created a thoroughly entertaining book about some rather unusual children. While the characters all have strange abilities, they are still children who want to belong, and who are tired of being treated differently. The craziness that results when they come together results in some rather amusing events. And yet the themes of friendship and adapting to differences shine through loud and clear. And mixed in with all of that are typical camping experiences involving fires, latrines, and girls. I enjoyed watching Emerson and his friends change over the summer as they become friends as well as cabin mates. In addition to the more serious themes, there is enough silliness (and yes, grossness--roping pigs anyone?) to satisfy most middle grade readers. Anne has spent most of her thirteen years dreaming of the day she and her best friend Penelope will finally leave Saint Lupin's Institute for Perpetually Wicked and Hideously Unattractive Children. When the big day arrives, a series of very curious happenings lead to Anne being charged with an epic quest. Anne, Penelope, and new questing partner Hiro have only days to travel to strange new locales, solve myriad riddles, and triumph over monstrous foes--or face the horrible consequences. If you enjoy snarky comments and plenty of humor, this enjoyable fantasy novel is for you. I'm a fan of snarky comments and humor so I really enjoyed this book. Anne has spent her entire life at St. Lupin's Institute for Perpetually Wicked and Hideously Unattractive Children (orphanage). The existence is not a pleasant one as the children spend most of their time completing punishments or doing chores. The only thing that made it bearable was the presence of her best friend, Penelope, and the library out of which she sneaks books to read. Anne is thrilled that the day has arrived that will allow her to leave. But things don't turn out the way she hoped. First she's told she has to stay for another year, then while tending the Matron's fire lizard, she falls off the end of the world (the world is made up of tiers that do end) before being recruited to a quest academy. But things get worse when she ends up in the orphanage dungeon followed by a crazy escape that leads to being blown on by a dragon and an encounter with zombie sharks. Once she and Penelope arrive at the quest academy, Anne hopes things will calm down. But it turns out she inadvertently started a quest that she must complete. The problem: she has absolutely no training whatsoever and it's a high level quest. Disaster continues to plague Anne and her companions as they set out on their journey. But Anne's determination, Penelope's fierceness, and Hiro's magic may not be enough to save them. The book contains advice from various quest-related books but in reality isn't very helpful. For example, in a pamphlet entitled: The Limitations of Forever: the reader is told "don't bother trying to picture infinity. It's impossible". For readers who enjoy a good dose of laughter along with their adventure this is a fabulous series. The unusual combination of quest literature, world tiers that end, and strange references to technology also make for a fun read. White has written another snarky, humorous adventure novel with this book. 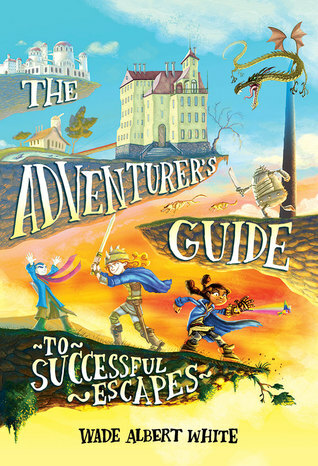 After their first madcap adventure, Anne, Penelope, and Hiro have enjoyed a bit of calm as they settle in at Saint Lupin's Quest Academy for Consistently Dangerous and Absolutely Terrifying Adventures, which Anne owns. But it's the calm before the storm. After arriving at the capital city of the Hierarchy to receive an award, things begin to go wrong in monumental ways. Anne's gauntlet gets stolen, iron robots come alive, and Anne ends up with another unexpected and unwanted quest. And this quest isn't just life-threatening, but war-threatening. Once again it's up to Anne and her friends to somehow save the day in their rather unorthodox way. One of the things that I've especially enjoyed about this series is the twists and turns that jump out at one from behind almost every chapter. One really can't predict where the story is going to go next. Which is why I'm eagerly awaiting the next book in the series which involves pirate treasure. So many fantasy stories follow tried and true tropes that I always find it refreshing to find one that stands on it's own as uniquely as this series does. The combination of fantasy and science fiction elements is so unique that I can't really think of any books to relate it to. 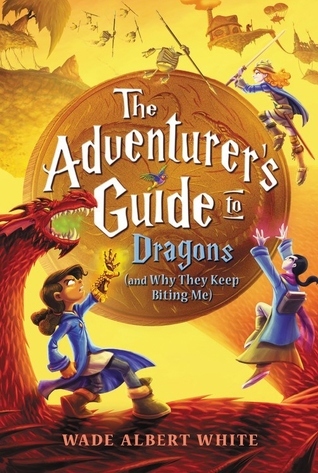 Just know that if you have a middle grade reader who enjoys a strong dose of snark and sarcasm with their fantasy adventures, this series makes for a wonderful place to start. Join the Lizard Lady as she cuts her way through thick Caribbean forests searching for critically endangered St. Croix ground lizards. Hunted to extinction on the island of St. Croix by invasive species brought by colonizing farmers, these lizards are now only found on surrounding islands in the US Virgin Islands. Readers learn that scientists can be women and that the day in a life of a scientist can be anything but boring. Co-author Nicole F. Angeli IS the Lizard Lady--can she help save these animals? This brief book takes a look at the scientific work of Dr. Nicole Angeli as she strives to help save the endangered St. Croix ground lizards. Dr. Angeli is one of the co-authors of the book and adds a legitimacy to the story. This narrative nonfiction gives young readers a glimpse into what it's like to be a field scientist and the importance of what they do. 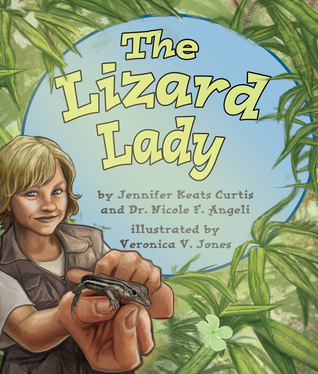 The story follows Dr. Angeli as she searches for a lizard, finds one, and gathers data about it to help her studies. As with other Arbordale titles, this book contains suggested activities and additional information at the end of the book, making it especially useful for teaching and families that like to extend their reading. This book shares information about komodo dragons in a rather unusual way. A girl corresponds with a komodo dragon through letters. And through the letters the komodo dragon tells the girl about himself and how he lives. This makes for an imaginative presentation of information in a fictional format. 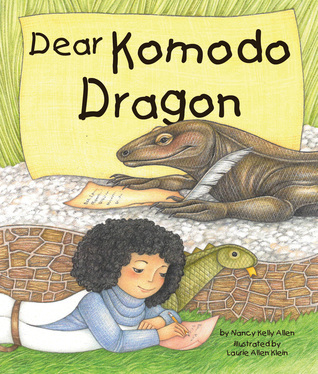 The illustrations are charming and relatively accurate for a komodo dragon writing letters. There are several activities included at the end of the book for extended interaction with the book and it's information. Additional resources can be found at the publisher's website. WILD & WONDERFUL WEDNESDAY: Pluto is Peeved!/Look at Me! Pluto is peeved. And who can blame him? He was once considered one of the Solar System’s nine planets but was unceremoniously demoted. “Why do scientists think it is all right to change things?” Is just one question Pluto asks as he roams the science museum in search of answers. 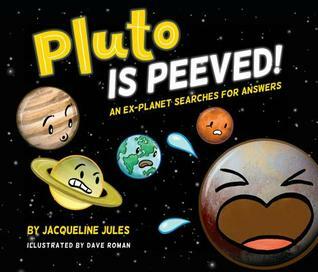 The animated comic format picture book addresses Pluto's feelings about being rejected as a planet. He doesn't understand why he was downgraded and goes searching through the museum in search of answers. Instead he discovers some of the subjects that scientists work to learn about, including dinosaurs, bacteria, and rocks. Eventually he realizes that though he's not considered a full-sized planet anymore, that doesn't mean he isn't of interest. This is a fun way to explore an interesting topic. This Pluto would be glad to know that some scientists are now saying that Pluto should be a planet after all. Extra information at the end of the book provides further development of the ideas raised in the main section of the book. With his signature breathtaking art, plus stunning gatefolds, acclaimed naturalist Jim Arnosky introduces children to the most eye-catching creatures in the animal kingdom! Meet the show-offs! With their wacky eyebrows, beautiful patterns, and bright feathers and scales, many animals seem to be saying: “Look at ME!” That behavior certainly won’t protect them from predators, so why do they do it? Jim Arnosky explores a multitude of creatures from across the globe to reveal the reasons behind their attention-grabbing behavior. His spectacular art, including amazing gatefolds, presents brilliantly colored poison arrow frogs of the rainforest; the breeding plumage of egrets and peacocks; the impressive antlers of deer and elk; the threatening hoods of cobras; the balloon-like displays of African bullfrogs; and the dramatic color transformation of spawning fish. As in his other books, Arnosky has once again created beautiful paintings to go with his informative text about animals that use various methods to stand out. Mentioning everything from fanned tails, to horns and antlers, skin spreading, noise makers, inflators, and fancy feathers, Arnosky shows the reader some of the things that make these animals so interesting. Some of the animals are shown in beautiful, full-color glory, others are shown in pencil drawings, with a few gatefolds showing off these animals unique traits. Arnosky has delivered another beautiful book honoring the natural world in which he has spent so much time. "Each day came and went with no child to take them home. The monsters decided it was time to make a plan of their own." 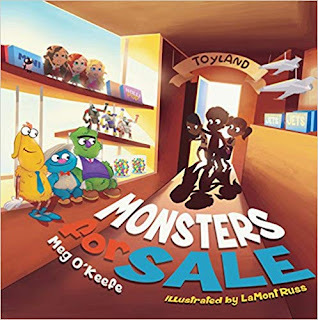 Joy and contentment soon lead to worry as three toy monsters realize their plan to find the love of a child is falling apart. Will she return them? Will she give them away? Or maybe-just maybe-she will help them to discover that simply being themselves is always enough. This is a cute story about the importance about being yourself. While it felt a bit didactic in its delivery of that message, the illustrations are cute enough to overlook that. Here we have three monsters who are afraid that no child will ever want them the way they are, too many children have walked away. So they put together a plan and hide as much of themselves as they can behind clothes. When a young girl adopts all three, they feel like their lives are set for good, until their clothes get dirty and tattered and must be taken off. Will the girl still love them when she sees them in all their glory? The book is missing a bit of polish, and the changing colors of the text is a bit distracting, the book is still cute. Preparing children for an unpredictable event, such as an earthquake, is one of the best ways to reduce trauma and maintain children's mental and emotional well-beings. We combined our experiences as a Marriage & Family Therapist and School Counselor to write this book, both specializing in work with young children for more than 20 years. Our first-hand experience helping children cope with traumas, including natural disasters, is what opened our eyes to the need for this type of self-help guidance book. This book was written to introduce the concept of an earthquake, and to provide children with tools to stay safe and cope during the event. There are books available that teach children what to do during an earthquake. The purpose of our book is to address children's emotional well-beings and to help reduce their anxiety and fear. Children learn through repetition. We recommend reading and practicing the skills introduced in this book on a regular basis. This book can also be used post-earthquake to help kids cope with their emotions and help them make sense of what has happened. When children know what to do, they are less likely to be scarred by the traumatic event. With natural disasters being a part of life in most parts of the world, it becomes important for parents and teachers to teach children how to cope with the possibility of living through one. This book sets out to teach children how to face an earthquake. The book is clearly intended to be used with fairly young children as it is quite repetitive. But that isn't a bad thing in this case. 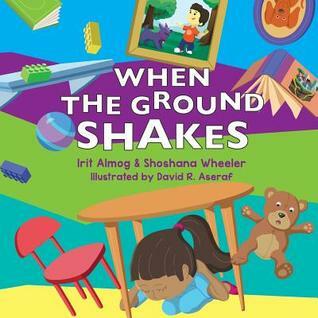 The book helps children understand what an earthquake is and how to respond if caught in one. I appreciated the inclusion of counting and singing favorite songs. I thought those were great strategies for controlling fear. Advice for how to be safe in different conditions is also helpful. While the illustrations are too animated for my taste, the solid nature of the advice makes that easy to overlook. 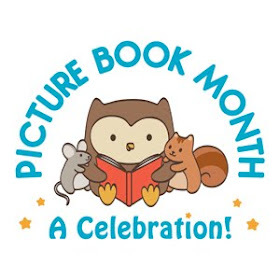 And young readers will probably be comforted by the cartoon illustrations. I'm now interested in having a look at the activity book that goes with this one to see if the activities are as solidly helpful as this book is. I'd highly recommend this title for those who have children and live in an earthquake zone. I was surprised by how much I enjoyed this book. The rhymes are delightful, the illustrations adorable, and the ending a surprise. It's also a fun counting book. 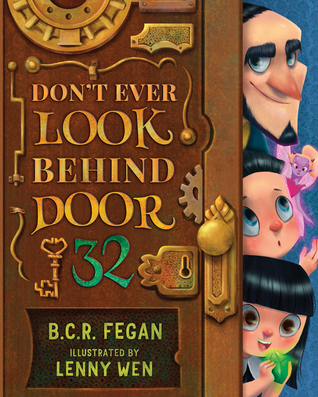 As the hotel's host shares with the children the many unusual guests and rooms in his hotel, he continually reminds them that door 32 is off limits. As the children get closer and closer to the banned room, I started speculating about what might be found there, but what is behind the door was not at all what I was expecting, and made me laugh out loud. A fun book all around. There was only one spot that bothered me and that was where the illustrations and the text didn't match. The text says a red broom, but the broom isn't red. The goblin in the picture should be purple to match the goblins mentioned earlier, but is green instead. But that is a smile gripe in the face of such an enjoyable book. "Have no fear, citizens! Captain Superlative is here to make all troubles disappear!" Red mask, blue wig, silver swimsuit, rubber gloves, torn tights, high top sneakers and . . . a cape? Who would run through the halls of Deerwood Park Middle School dressed like this? And why? Janey-quick to stay in the shadows-can't resist the urge to uncover the truth behind the mask. The answer pulls invisible Janey into the spotlight and leads her to an unexpected friendship with a superhero like no other. Fearless even in the face of school bully extraordinaire, Dagmar Hagen, no good deed is too small for the incomparable Captain Superlative and her new sidekick, Janey. But superheroes hold secrets and Captain Superlative is no exception. When Janey unearths what's truly at stake, she's forced to face her own dark secrets and discover what it truly means to be a hero . . . and a friend. 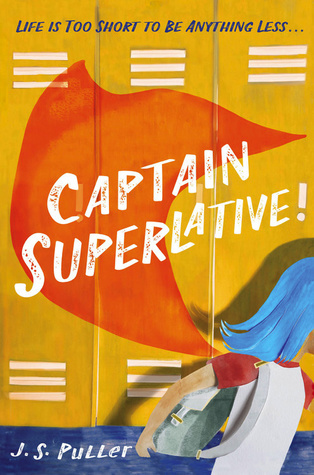 Like Wonder by R.J. Palacio, Captain Superlative is a book that touches the heart. I ended up in tears more than once. As in Wonder, this book revolves around the changes brought about by one person. But in Wonder, the main character is the one that inspires change. But in Captain Superlative, the main character, Janey, is a bystander. She goes out of her way to be invisible. She doesn't consider herself the type to rock the boat. Especially when Dagmar Hagan decides to torment Paige. Janey knows it's wrong, but she has no desire to become a target herself and so like everyone else, she does nothing. Things take a strange turn however when Captain Superlative shows up in full-on superhero costume, blue wig, red cape and all. Captain Superlative's declaration leaves Janey feeling strange and overwhelmed. At first Janey is just curious about this seventh grader running the halls of the school doing good deeds. But she feels increasingly drawn to this girl who seems to have no fear of Dagmar and her cronies or of being called a freak. After following her home from school one day, Captain Superlative approaches her at school and invites Janey to be her sidekick. At first Janey appalled by the very idea. But after witnessing Dagmar crossing a line, she's unable to hold back any longer and finds herself joining Captain Superlative's campaign of goodness. But there is more to Captain Superlative than there appears, and Dagmar certainly isn't going to take her loss of power lying down. Will Janey find the courage within herself to carry on, even if she must do it on her own? Puller has created a story full of joys and heartaches as Janey learns about the possibilities that exist outside of social invisibility. And yet, stepping forward into the spotlight can be terrifying, especially when a bully is just ready and waiting to make you a target. I loved the relationship between Janey and her father. Her father's sense of humor helped balance Janey's serious nature and encouraged her to take a leap of faith after Captain Superlative sought her help as a sidekick. The awesome kind acts that Janey and Captain Superlative do made me smile as Janey learned the happiness that comes with helping others. I'll admit though that Dagmar's actions bothered me greatly, especially since there was never a teacher around to do anything about it. I figured out her reasons for behaving the way she does quite early in the story, but it didn't make her behavior any more palatable. Puller does a nice job though of combining humor with emotion, leading to a story that isn't as heavy as it could have been. It's impossible not to root for Janey and Captain Superlative and their campaign of kindness. A campaign that leaves the entire school changed. 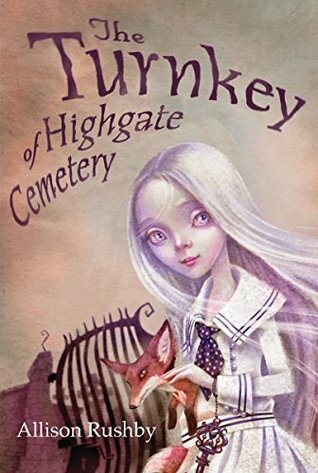 Twelve-year-old Flossie is no ordinary ghost — she’s the caretaker of every soul in Highgate Cemetery. And during World War II, even the ghosts are unsafe. Flossie Birdwhistle is the Turnkey at London’s Highgate Cemetery. As Turnkey, it’s Flossie’s job to ensure that all the souls buried in the cemetery stay at rest. Not an easy job for a young ghost, but a task made especially difficult by World War II: London is being attacked every night by enemy bombers, and even the dead are unsettled. When Flossie encounters the ghost of a German soldier carrying a mysterious object that seems to exist in both the living and spirit worlds, she becomes suspicious — what is the officer up to? Before long, Flossie uncovers a sinister plot that could destroy not only her cemetery, but also her beloved country. Can Flossie and her ghostly friends stop the soldier before it’s too late? History collides with the supernatural in this exciting, ethereal mystery from Allison Rushby. I've read books combining ghosts and history before, but none quite like this one. I admired the way Rushby created a believable ghost world revolving around seven major cemeteries in and around London while also connecting that world to the historical events of World War II London. Flossie is the turnkey of Highgate Cemetery. That means she's in charge of keeping the interred happy in their internment. While she's still learning about how to help her charges, she finds satisfaction and contentment in her job. At least until she runs into the spirit of a Nazi officer running around London during the Blitz. He doesn't behave like any run-of-the-mill ghost she's ever met. Her curiosity leads her to visit other cemeteries looking for help spotting the man again. When he does reappear it's in a place he shouldn't be and it's clear that he poses a threat to both spirit and living worlds. With the help of friends and acquaintances, Flossie seeks to find out what the Nazi officer is up to while still fulfilling her duties, but it proves to be harder than she expected. The story is a fascinating one, providing enough details to help the reader envision what's going on while still moving the story along briskly. An enjoyable read perfect for young readers who want something a little different in their ghost story while not being scared out of their wits. This quick easy read was thoroughly engaging and accurate. Survival stories fascinate me, not because of the trauma that characters, real or imaginary, go through, but the courage and judgment that so many survivors exhibit. 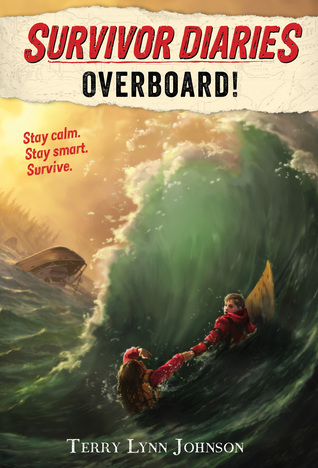 Johnson with her years of experience in the wilderness has written an exciting adventure story about two kids who have to survive on their own after the boat they are on gets destroyed by a rogue wave. Travis and Marina end up alone after getting swept away from the lifeboat. Combining their knowledge and skills the two must find a way to deal with the waves and most especially the cold water. Thanks to training received from her father, Marina knows what to do, but she's injured and as time goes by, Travis has to rely on his own ingenuity to take care of both of them. I appreciated the survival details and the real life survival advice included at the back of the book. This is a short quick read with large text, making it ideal for reluctant readers. This series also would complement well the I Survived series by Lauren Tarshis. 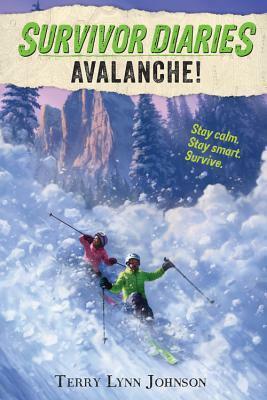 Johnson has written another interesting survival story with this book about surviving an avalanche. Twins Ashley and Ryan separate from their parents while on vacation in Wyoming in order to visit a wolverine observation station. But as they traverse the hillside, an avalanche occurs sending them tumbling down the hill. After digging herself out, Ashley must save her brother and keep them both alive until rescuers arrive. The details are fascinating and the tips for survival are good ones. Additional resources and an online game add to the fun of the book. Carter and Anna set out down a path through the rain forest of Costa Rica to see a statue next to a waterfall. When loud noises send them running through the brush, they end up lost and confused. 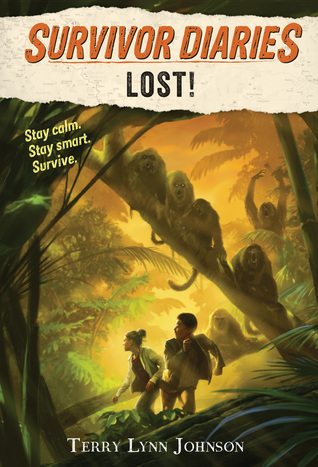 Carter has his emergency kit and Anna has a machete, so things don't seem so bad, until a monkey steals most of the emergency supplies, leaving the children with just the machete and a garbage bag. Somehow the two must find a way to survive the multiple dangers of the rain forest until help finds them or they find help. Carter deep-seeded anxieties don't help the situation any, but he remembers some of the things he's read in his efforts to deal with his anxieties. I liked the survival details, they were fascinating. But I also liked the fact that both Anna and Carter had to deal with internal conflicts as well as the outward ones in order to survive. Young readers who enjoy the I Survived series by Lauren Tarshis are probably going to like these as well. Things that crawl, fly, float, run, bloom, ripen. Think of everything Earth gives us. This beautifully illustrate book offers an ode to the many things that our earth gives us. Trees, water, air, and mountains, things big and small, simple and fancy, sights and sounds, are mentioned and appreciated. 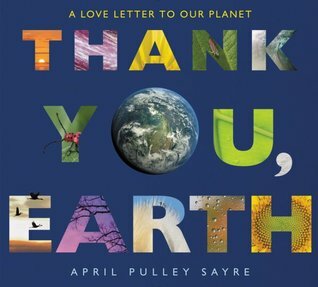 This would be a great book to use on Earth Day to remember the planet that is our home. The photographs are gorgeous, both the close-up and far away shots. The end of the book gives suggestions for how to expand the reach of the book, including ideas for how children can help our planet. A great educational and artistic endeavor, this book provides a powerful reminder of the fact that life would not be possible without the uniqueness of this planet. This oversized book pays tribute to the beauty and migration of the songbird known as the warbler. The book starts with photographs of a few of the places that the birds travel through on their migration. Further pages highlight the need to feed and rest and how and where they do so. 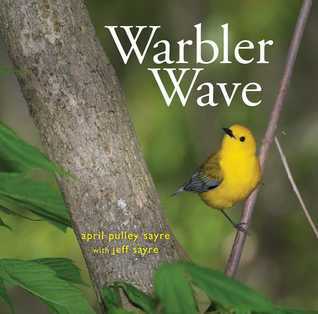 The end note provides more detailed information about warbler migration for those who are interested. 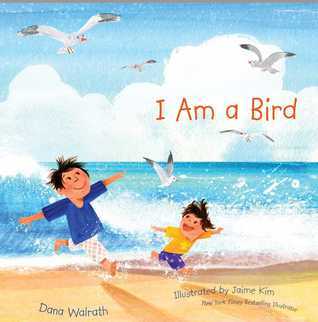 The poem highlights the basic skills and abilities that make the bird so beautiful. The poem is great, but it's the photographs that win the day here, especially oversized the way they are. Books like this help children develop a greater appreciation for the beauty and harshness of the world around us. 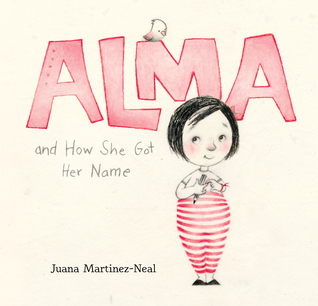 This cute book focuses on the family members from whom Alma gets her name. As her father explains to her about each of the people she is named after, she starts to appreciate the value of those family connections. She sees that she has characteristics in common with her ancestors and has her own story to tell just like they did. The illustrations are darling in their blue, black, and red shades allowing the reader to focus on Alma and her concerns. The book also encourages young readers/listeners to think about their own names and the stories they have to tell. A delightful book that opens the door to what could be some pretty interesting family conversations and a chance for young readers/listeners to begin to understand their own stories. My favorite part of this book is the illustrations. They are so bright and colorful and joy filled that you can almost feel the fun that the father and sun are having as they pretend to be birds, waves, and branches. Each action or experience leads to the next, starting with a bird, then a fly, then land, then the ocean, etc. The boy's imagination is fed by the things he sees and experiences. He sees a bird, he pretends to be a bird. He sees the wave crests, he pretends to be a crest. The poem and illustrations complement each other nicely with the illustrations expanding beautifully the simple words of the poem. While riding the subway home from the pool with his abuela one day, Julián notices three women spectacularly dressed up. Their hair billows in brilliant hues, their dresses end in fishtails, and their joy fills the train car. When Julián gets home, daydreaming of the magic he’s seen, all he can think about is dressing up just like the ladies in his own fabulous mermaid costume: a periwinkle curtain for his tail, the fronds of a potted fern for his headdress. But what will Abuela think about the mess he makes — and even more importantly, what will she think about how Julián sees himself? 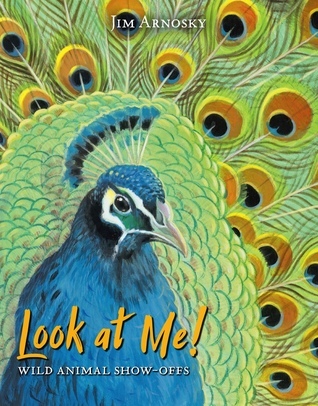 Mesmerizing and full of heart, Jessica Love’s author-illustrator debut is a jubilant picture of self-love and a radiant celebration of individuality. Julian sees three women dressed as mermaids one day on the subway and loves their costumes. When he and his grandmother get home, he creates his own costume while his grandmother baths. The key moment is when his grandmother gets out of the bath and sees what he has done. The reader knows that her reaction will either make or break the boy. Now whether you agree with a boy loving mermaids or not, the theme of the need children have to be creative shines through loud and clear. And Julian's grandmother understands that and instead of smothering his efforts she encourages him. 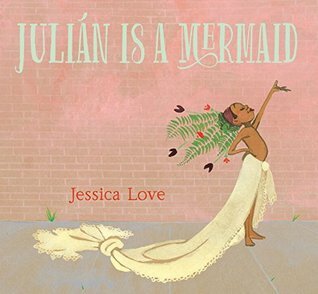 The illustrations are lovely and do a great job of demonstrating the fascination that Julian has with the mermaids he sees and the joy he experiences from copying what he has seen in his own way. Lucy hasn't attended school since she was in second grade. 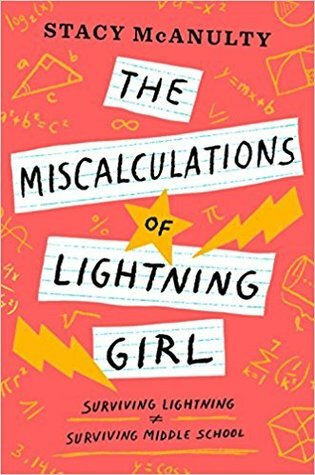 After having been struck by lightning and developing acquired savant syndrome, Lucy developed genius math abilities. But it didn't help her develop people skills. After an unpleasant second grade year, her grandmother home schooled her. Now Lucy feels ready to move on to college level material, but her grandmother wants her to spend at least one year in middle school. Lucy isn't happy about this, but she doesn't have much choice. But Lucy's OCD habits and genius mind make her stand out in ways she doesn't want. So she works to hide her genius and ignore the taunts of her classmates. She does make a friend, sort of, but she doesn't really know how to be a friend and she doesn't trust her. When she teams up with her friend, Windy, and another kid named Levi, Lucy is forced to get involved in a service project. Helping get dogs adopted isn't her idea of a great project, but at least helping with the record keeping allows her to use her math skills. Things start to shift though as she begins to learn what it's like to be a real friend. Then one of her new found friends commits a betrayal she finds hard to forgive. I'll admit this book made me cry. The way that Lucy was treated made me cry and I felt angry right along with her. I had to work through the emotions the book raised in me right along with Lucy. As most of us learn though, true friendship requires forgiveness, if it didn't none of us would be likely to have friends. A powerful story about being different and learning to accept that, something most middle school students struggle with as well as friendship. All the math was kind of interesting too.